September 2017, Asia Pacific – Nepal is one of the world’s most vulnerable countries to climate change. A project to safeguard lives and livelihoods against flood and glacial lake outburst floods is now taking shape, targeting finance from the Green Climate Fund. Around the world, poorer countries are hit disproportionately by climate-related disasters, in loss of life, economic impacts and personal hardship. Nepal is an example of a UN-designated Least Developed Country whose people have contributed little to greenhouse gas emissions driving climate change, yet are suffering the impacts - among them, the risk of “GLOF” or glacial lake outburst floods. GLOF risk is increasing as temperatures in the Himalayan mountain ranges rise and glaciers melt, forming lakes filled with millions of cubic metres of water, soil and rock. Outbursts can have catastrophic consequences for communities living downstream, taking lives and washing away livelihoods, assets and infrastructure. In early 2016, the Government of Nepal requested UNDP’s assistance in formulating a funding proposal for the Green Climate Fund, addressing the risks associated with GLOF. Since then, work has been ongoing to conduct the necessary consultations, research and assessments to develop a strong adaptation proposal, in line with communities’ needs as well as the Green Climate Fund’s investment criteria. Missions in April and August this year, led by the Ministry of Finance, with UNDP Nepal support, have brought together a range of stakeholders – including relevant Ministries, academia, international non-government organizations, and local non-government organizations – to solidify the project’s concept and priorities. 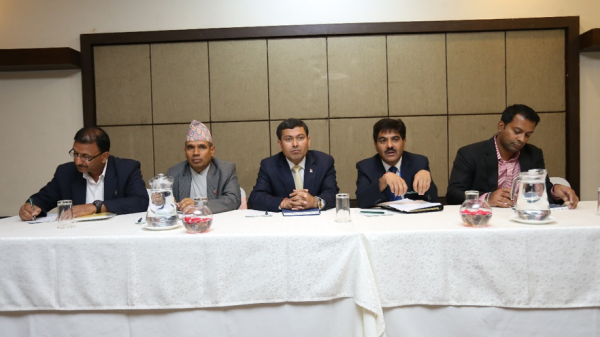 At the Stakeholder Workshop on GCF-GLOF Risk Management Project Formulation on August 3 2017, from left to right: Mr Bijay Raj Poudel, Dr Rishi Ram Sharma, Dr Bishaw Nath Oli, Dr Baikuntha Aryal, Dr. Pradeep Kurukulasuriya).. At the event, Chief Guest Dr. Bishwa Nath Oli, Secretary for the Ministry of Population and Environment, highlighted climate change as a priority for the Government as reflected in Nepal’s National Adaptation Plan of Action 2010, Climate Change Policy 2011, Nationally Determined Contributions 2016 and the guidelines of the current three-year plan. Among the elements, a focus on the needs of the most marginalized populations, including remote indigenous communities and women, and a focus on improving monitoring, and the capturing and sharing of data. In Nepal, the availability of data on very high-altitude areas is patchy. While the Department of Hydrology and Meteorology, within the Ministry of Population and Environment, will be the main implementing/executing entity behind the project, some activities will be carried out by the Department of Soil Conservation and Watershed Management, within the Ministry of Forestry and Soil Conservation. Partners include the International Centre for Integrated Mountain Development (ICIMOD) and with Kathmandu University and Tribhuwan University, as well as civil society organisations and the private sector. The proposal builds upon the achievements and best practices of existing and past projects in other areas, for example, the Comprehensive Disaster Risk Management Programme and Community Based Flood and Glacial Lake Outburst Risk Reduction Project, funded by the Global Environment Facility Least Developed Countries Fund and due to come to a close at the end of 2017. Based on the experiences of these projects, the new proposal will implement a basin/watershed-based approach, linking upstream and downstream communities, in close collaboration with local government and existing community-based organisations under the overall guidance of national and provincial governments. A Project Formulation Guiding Committee, led by the Department of Hydrology and Meteorology with members from the Green Climate Fund's National Designated Authority (the Ministry of Finance) and Department of Soil Conservation and Watershed Management, is meeting regularly to drive the proposal’s formulation and address technical issues. The team is aiming to submit a Concept Note to the Green Climate Fund by the end of September 2017. Following feedback and adjustments, the goal is to submit the proposal in time for consideration at the February/March 2018 Board Meeting in Seoul.